Home Blog Tips Blogging Advice - What NOT to do. Blogging Advice - What NOT to do. These days everyone is a blogger. According to Quora there a more than 1.5M blog posts per day! The competition to break through is fierce. I started on a whim a couple years ago as a hobby a few hours a week and was quickly amazed at the challenges. Knowing what I have learned from blogging, marketing and social media promotion, I am going to share my blogging wisdom on what NOT to do when starting a blog. Don't copy - find your niche. In order to stand out and attract readers you need to find your voice and your niche. I know it's easier said than done with the millions of blogs on every possible subject. But, if you can benefit from your content so will your followers. Make it interesting and fresh. Don't quit your day job to start a blog. Many bloggers expect to make income off their blogs. When in fact it takes years for majority of bloggers to see any revenue if at all. It's a numbers game. You need visitors to make money off ads or affiliates and thousands of followers to become an influencer. Of course neither of these are guarantees. Don't start a blog expecting Instagram fame. There are a very few lucky bloggers who have a post go viral and reap the benefits of thousands of followers overnight. For the rest of us, it takes dedicated, frequent posting of great content and images to increase followers. You need to be actively engaged in all social media platforms and join groups, boards, channels and lists to post your content. 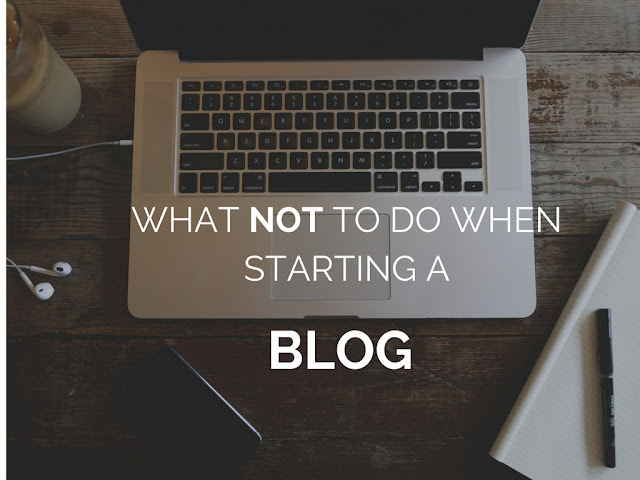 Don't start a blog and expect not to spend money. Blogging takes a financial investment. You will need to host your blog, buy your URL, pay a designer to make your blog visually appealing, (Fiverr keeps these costs down) and invest in Facebook ads. Other costs might include a fancy DSLR for better pics and yes purchasing the goods to blog about or traveling to share your trip highlights. Don't start a blog without making the time commitment. Blogging is way more time consuming than you could ever imagine, especially if your a solo blogger which most of us are. It takes time to research content, create posts, edit photos, post to social media platforms, manage engagement with followers and lastly track analytics. Don't get discouraged. There will be days when you have spent hours creating an awesome post for a handful of followers and you will wonder why your wasting your time. If it brings you happiness and pride just do it - the followers will come, the ad revenue will trickle in and you might strike gold as an influencer or Instagram fame.